Hello everybody! I've finally got my mailing list back up & running after some technical difficulties - and WOW I have a lot of exciting things to tell you all about. Hope you all have had a marvelous Autumn so far. First things first - it is that time of year again - it's our annual Black Friday Sale - today through the end of Monday - EVERYTHING at Strangeling.com is 25% OFF with coupon code THANKS2018 - no limit. Everything, even originals, masterpiece editions, pins, books, coloring books, Canvas Cuties, tarot cards, everything. Best sale ever. We are always happy to ship worldwide of course too! Enter THANKS2018 into the discount/coupon code field in your shopping cart during checkout and it will apply to everything ( THANKS2018 has no spaces and is in ALL CAPS). Pssst - speaking of the sale, if you happen to be a 10+ level Patreon Patron, be sure to login with your patreon email address and you can also use your PATREON10discount code in the discount/coupon field in your shopping cart in addition to the THANKS2018 code and you'll get an additional 10% off, giving you a whopping total of 35% OFF. Not yet a 10+ Patreon discount tier member? You can sign up heretoday (you can even cancel tomorrow if you want, lol, I won't hate you) just to get your extra 10% off - it takes less than a minute to sign up, just wait for the email from us confirming your code is setup (we have to enter it manually) and then you can start saving hundreds or even thousands of dollars (depending what you buy) for only the $10 subscription fee (again, you can cancel whenever). My friend Paul at StrangelingUK.com is also running 25% off with coupon code THANKS2018 so if you live in the UK OR if you live ANYWHERE else but want to order UK Exclusive items, check up there too (note: Patreon discount doesn't work on StrangelingUK.com as that is owned/run by Paul, not me). Secondly, since we've last spoke - I have posted literally dozens of brand new artworks now available as prints up on my website here (everything is included in the big sale!) - loads of prints & canvases from my "Magical Thinking" show are now available at Strangeling as well as many other new paintings I've been working on this Autumn. To jump to all the NEW prints just click here! Thirdly - later next week I am leaving for Asia. I will be out of the country for the first half of December. This means that if you are wanting to purchase something that needs to be hand embellished by me in paint (Limited Editions, Masterpiece Editions, original paintings) - hurry up and order them now if you are wanting anything like that to ship in time for Christmas! You don't want to be cutting it too close (and I can't help with that, lol, I warned ya!) if it's a gift. Besides, since we're running the sale now you're better off ordering now so you'll save $$, let alone having to worry about looking at tracking numbers online on Christmas Eve - I promise! Fourthly - for my Florida folks - I'm already getting ready for my annual December show - December 22nd at Pop Gallery at Disney Springs! Details are here at the event page. More details will follow soon - I'll be debuting a new Pop Gallery Exclusive painting / prints / canvas entitled "Luna Moths" as well as a set of Pop Gallery Exclusive Strangeling Pins featuring my Pirate Girls! We'll also be giving away a free Event Exclusive pin called "Seashell Collector" that will be given away free to the first 200 customers (pin giveaway starts at 4PM at the gallery, I'll be there in person from 6PM-9PM to sign autographs. My "Forever Strange" art book is out now and is available to order! It would make a fantastic gift for anybody to whom you'd like to introduce my artwork, or for anybody who is already a fan ;) This is a glorious sequel to my "Strangeling" art book - hardcover 198 full colour pages, gilded edges, full of my paintings and complemented by poetry & short stories written by my sisters Amber and Kachina and a short story by my husband Matt. You can order it (and yes, the discount code works on books too) autographed by ALL FOUR OF US worldwide up at my Strangeling website here . Don't need a signed copy and want to spend a bit less? BookDepository offers free worldwide delivery here or you check out the publisher's website here you can also order there internationally (not autographed, but in stock for sure!). And finally - for my PIN PEOPLE! We have many new pins since my last mailing list update. Check out all my pins HERE (they are included in the sale too, any in stock now or on backorder!) Our November Pin of the Month is "Alice's Advice" and our current Patreon Exclusive Pin is "Strawberry Cupcakes!" 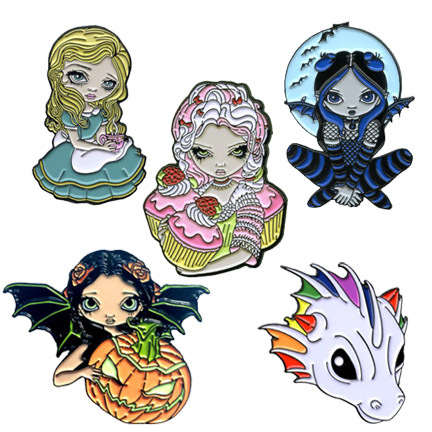 If you happen to join the Patreon Pin Collector tier, you'll start off with the Alice's Advice pin, the Strawberry Cupcakes pin, and the current Strangeling lanyard for only $25 (and you get all the Patreon discounts, previews, freebies, exclusive coloring pages & more Patreon perks) including worldwide shipping. You'll then follow up next month with "Mistletoe Fairy" and all the subsequent Pins of the Month and all the subsequent Patreon Exclusive pins and new Strangeling Lanyard designs whenever they are released! Join here! Also too - we have a free Facebook Group you may want to pop in at the Official Strangeling Pins Group here where you can trade pins, buy/sell Strangeling pins, generally chatter about pins & stuff, make plans with fellow pin collectors to meet up & come to the pin events, and so forth - it's an amazing group of people - everybody is welcome - join the free Facebook Group here and have fun! PS - most of these paintings are one I painted LIVE up at my Twitch channel! I'll be back broadcasting live from my studio easel after I get back from Asia - the next scheduled broadcast will December 19 starting at 4PM Eastern Time (1PM Pacific Time, 21:00 UK Time) - mark your calendar or set your phone reminder, you can watch me paint up on my public Twitch channel HERE (it's free, all are welcome). If you missed a broadcast or want to catch up you can find several weeks' worth of videos in the Twitch video archive here and you can find even earlier/older broadcasts exported to my YouTube archive here. I'll be at Pop Gallery at Disney Springs here in Florida to release my new "Luna Moths" exclusive artwork and to debut my new Pop Gallery Exclusive pirate girls pin set! I'll be there from 6-9PM in person for autographs, etc. We'll have an Exclusive "Seashell Collector" Pin for the event as a giveaway too for the first 200 customers! Tons of my artwork & merchandise will be on hand and I'm happy to sign anything. Champagne for grownups and children are welcome! Details are here. I'll be at EPCOT at Disney World throughout the Epcot International Festival of the Arts here in Florida! Specific dates will be posted soon! I will have two tents (WonderGround Gallery's tent for my Disney art, Pop Gallery's tent for my personal art) open for the duration of the Festival, and I will appear several evenings at both tents. WonderGround will have THREE new Disney pieces of mine they will be debuting - "Cruella" - "Princess Tiana" and a new "Cinderella!". Pop Gallery will have a special Festival Exclusive Strangeling Pin for sale only at the show, too! Again, I will post my specific schedule as soon as it is confirmed - stay tuned for details on my placeholder event page here. Spectrum Fantastic Art LIVE has joined forces with Planet ComiCon in Kansas City! Should be truly fantastic. I (and a hundred other amazing artists in the art show) will be at Planet ComiCon on behalf of Spectrum. We'll have a booth with all my art & merchandise (new paintings, a new giveaway pin etc.) open all day every day for all three days. I will be there in person for scheduled autographing periodically throughout the show. Details about the event are here! My biggest event in Florida is MEGACON! We'll have a huge 30 foot booth with all my art & merchandise (new giveaway pins and loads of other free swag) open all day every day for all four days. I will be there in person for scheduled autographing times each day. Details about the event & the giveaways etc will be forthcoming. My next giant solo show will be in the year 2020 with CHG. I don't know the date yet, probably later in Autumn 2020. My biggest ever solo show is being held at the Corey Helford Gallery in downtown Los Angeles, California. Should be something rather spectacular. Free event, free snacks & open bar, I'll be there from in person for the opening and the show will hang for a month! Details coming soon. Many more events are already scheduled - click here!